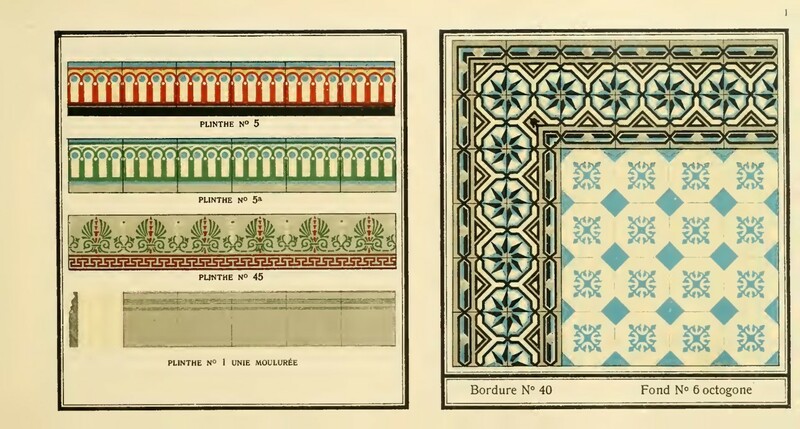 92 Belgian Art Deco ceramic encaustic tiles, dating from the 1930's, manufactured by Societe Anonyme des Produits Ceramiques St Remy-Chimay, we include a scan from their original catalogue showing the tiles. The tiles can be laid as singles or back to back runs. 15cm square and 15mm thick, the tiles have cleaned very well and arrive ready to relay. No surface wear, consistent slip colours, an occasional few displaying small groutable chips and edge nibbles. A highly fired tile, they can be laid inside or outside of the home and will work very efficiently with under-floor heating systems. Can be used in their entirety for framing a modern ceramic or an antique wood parquet floor. With the possibility to sell by the meterage they can also be used as chimney tile inserts, on a kitchen wall work surface run or as splashback around an antique bath, shower or sinks. Total weight of 75 kgs. If you have any questions regarding our Art Deco ceramic Belgian border tiles, single or back to back, simply complete the short form below and we'll respond to your enquiry as soon as possible.